If there's one thing I'm good at, it's buying crafting supplies. The one thing I'm bad at is keeping track of what I've bought. Sometimes I end up buying double because everything gets tucked away somewhere so I don't even realize what I have. So....a ribbon holder is born! This is very similar to the Nail Polish Holder project I showed you a couple of weeks ago. 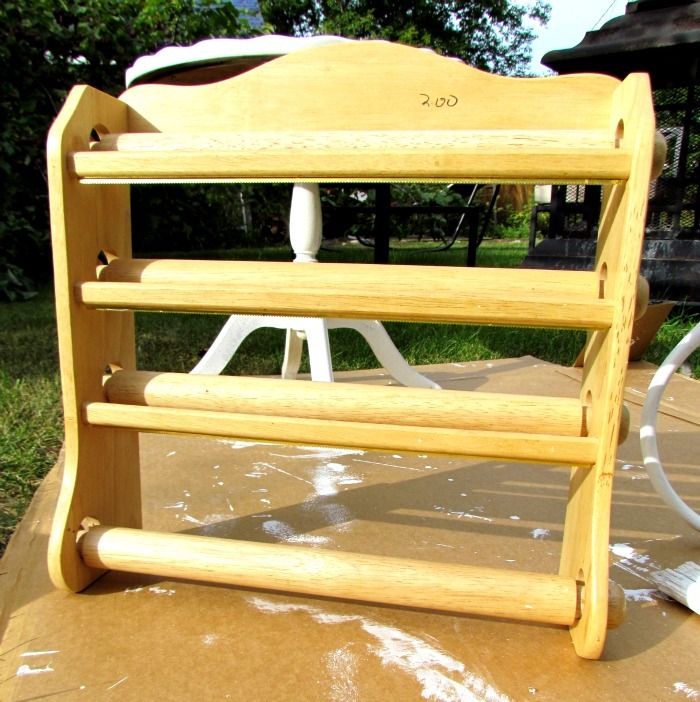 I just took something that everyone uses in the kitchen, and transformed it into something anyone can use in the craft room. It's supposed to hold saran wrap and tin foil and stuff like that. As you can see in the background I was on a bit of a priming rampage. Anyway, this was sitting in my porch screaming at me to do this project already! So after I taped the little cutter edges, it got primed and painted white like everything else within my reach that day. I took out one of the big rolly holders and replaced it with some small dowling I had left over from my Sunglass Holder project. 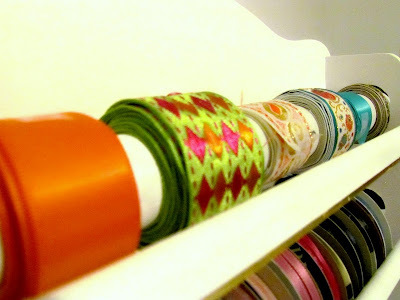 This was perfect for the ribbons on spools. 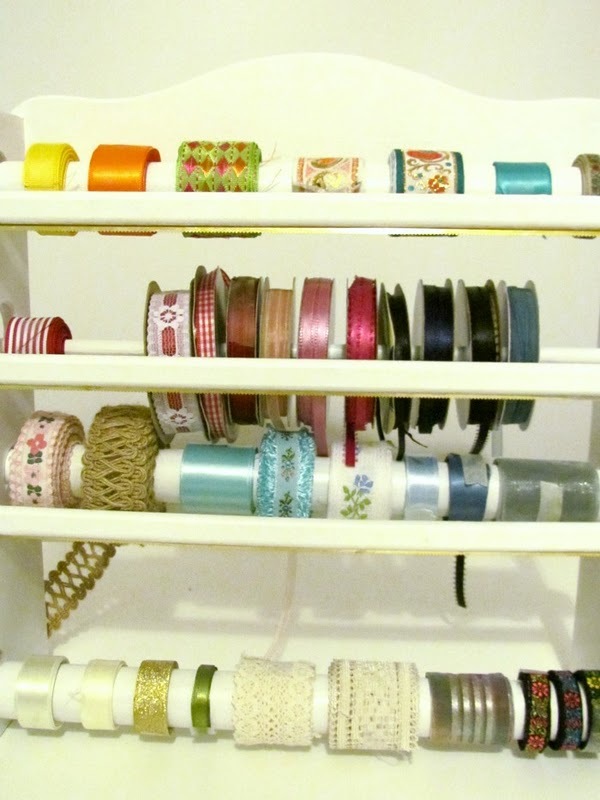 Now all (Ok, most) of my ribbon and trim is out where I can see it. I think it stands a better chance of being used this way instead of sitting in little bags inside of my notions hat box. In fact, I like this so much I'm going to try to keep an eye out for another one to use for elastic and lace! What do you think? How do you store your ribbons? The great thing about this holder is that it's already fitted out for hanging on a wall. 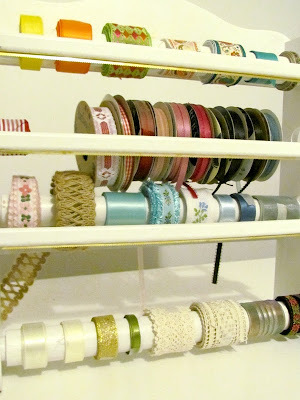 I have a feeling it'll end up inside my craft closet on the wall so everything's super handy. I'll be posting at the linky parties all week but don't forget to come back here on Sunday night to add your projects to my new linky party (Make it Great Monday) ! Love it! What a creative re-use! Very cute! This turned out great!! Visiting from Serenity Now Link Party. This is awesome! I think I need to be on the look out for something like this. I currently have an under the bed storage bag that is stuffed full of ribbon. Thanks for a great idea! I really like that idea. Right now I am using a couple gun racks and dowel rods. This is so much better. That is a really good idea. Right now, all of my ribbon is spread into three different shoe boxes, I definitely like your idea better! LOVE IT!!!! NEED IT!!!! : ) lol!!!! my eyes are peeled for one of these beauties for sure! thanks for sharing it is fabulous!!!!! hugs! That is a fantastic idea. I keep my ribbon in a plastic shoe box and often find myself buying more of the same because I don't remember what I have. This way I'd look at it all the time. Great! Looks great! New follower here from More the Merrier Monday. I love this! Where do you find the storage racks? I've never seen one before. yup...i sooo need one of these!! great job! !